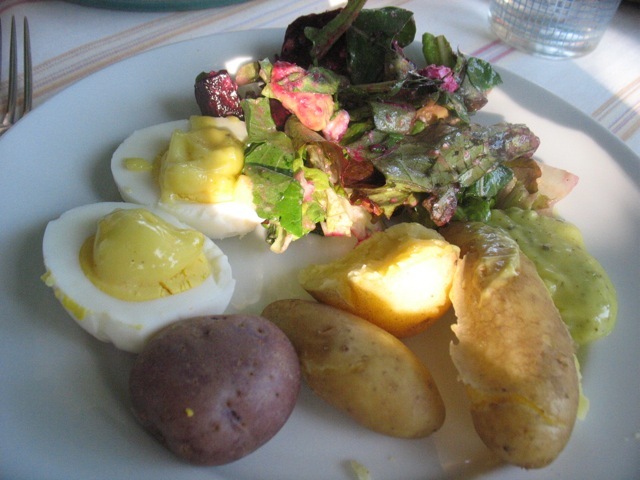 Faux deviled eggs (plain boiled eggs topped with aioli), boiled new potatoes and beet and avocado salad. 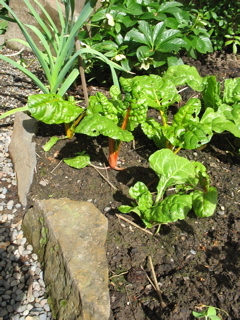 Herbs, hardboiled eggs, salads, fresh fruit, bread, cheese. . . .zucchini and green beans starting to come out of my ears. . . .It’s a good time of year for cooking (or assembling) with what you have. And as much as I love to cook I don’t really want to be at the stove much (other than making jam and baking pies and tarts) these days. We’ve been having a lot of dinners of late that I loosely refer to as Abendbrot–the German word for a light evening meal, meaning literally evening bread. I use the term to refer to any meal that is cobbled together with a variety of cold or room temperature items. Last night it was cooked green beans with aioli, the last jar of tomato jam from last fall, some bread, a few hard-boiled eggs and a bunch of blueberries. It might be steamed artichokes, a green salad and bread, or roasted beets, some canned tuna (delicious Oregon Albacore) and a white bean salad. We’ve been digging our first couple of hills of potatoes and they need nothing more than salt or a bit of aioli or some fresh parsley to be perfect. And speaking of parsley I made a pesto with parsley and toasted pumpkin seeds last week that may well find itself into my Herbs in the Kitchen class in August. 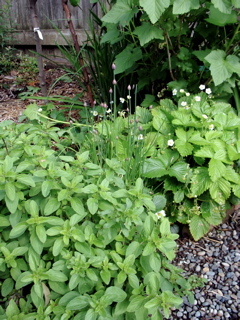 If you grow a few of your own herbs, they are really the cheapest and tastiest way to shape a meal. 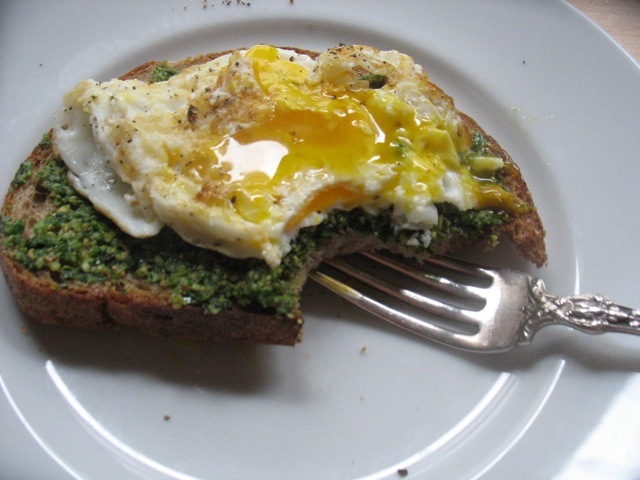 Toasted bread topped with parsley and pumpkin seed pesto and a fried egg. When I’m really pressed for time dessert has been fresh fruit, as is, and thus my five-year-old has become an expert cherry eater and cherry pit spitter. But I have also been staying up late or baking in the afternoon and then working late at night to make this fantastic cherry slab pie from Smittenkitchen, David Lebovitz’s blackberry sorbet , the Tutti Frutti Crumble from Super Natural Everyday and jam after jam after jam. 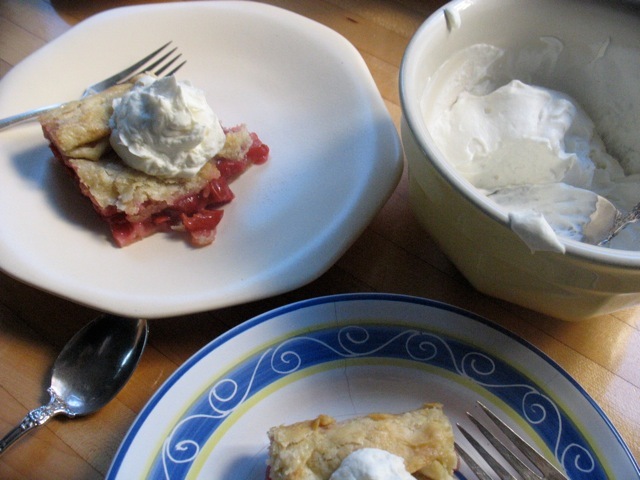 Cherry slab pie from smittenkitchen.com–you get a bit more crust per cherry, it feeds an army and is most of all perfectly delicious. This time of year is a conundrum for me. I get greedy. I want to pack that freezer with berries, make all my favorite jams and keep up with the green beans and parsley and squash in my garden. I have this slightly frenzied feeling in my body that is hard to control that makes me pit cherries and apricots faster and carry more canning jars up from the basement at once than is wise. I’m racing with myself and some deep-seeded need to preserve and not waste and take advantage of our ridiculous bounty right now. I feel so blessed to have all this amazing produce and fruit at my finger tips. So it’s one part greed and one part responsibility to use it and make the most of it and be frugal, frankly, so that for several months out of the year I wont buy much fruit at all. It’s a privileged position to be in–to have a flexible enough schedule to do this kind of thing–and a choice I’ve made deliberately. And I’m very grateful for that. And at the same time I want to let myself relax a bit and enjoy these fleeting weeks of warmth, neighbors on the porch sharing in that cherry pie, the sticky jam jars and even the fruit flies. 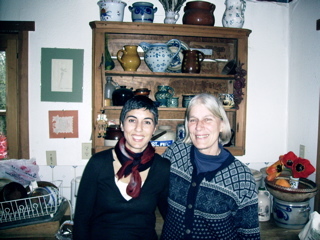 Happy eating, cooking and preserving! My four-year-old son Ellis and I spent a night at my mother’s place last week. 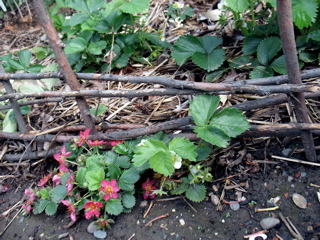 She lives in the middle of nowhere and has neighbors with cherry trees and fruit picking ladders. 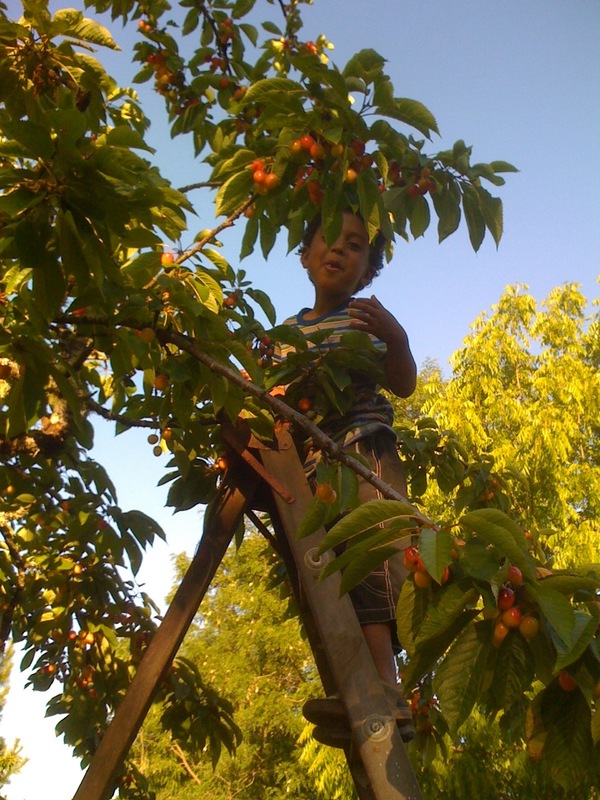 Ellis climbed right to the top of this rather tall ladder and ate his fill of Royal Ann cherries, gleefully spitting the pits down onto our heads. Actually he mostly missed our heads but cackled with each dropping pit. The setting sun and a sticky, happy kid . . .. Summer, finally here (though absent again today) is so wonderful. And if you have lots of cherries and need a new idea for them, try this wonderful recipe by David Lebovitz for Cherries in Red Wine Syrup. My cooking has been somewhat sporadic and a bit frenetic of late. We’ve been out-of-town, had visitors, had lots of picnics and barbeques, even a meal or two out. I want to be outside all the time and am spending more time processing berries than making dinner. This means we’ve had a lot of frittatas, salads and artichokes for dinner lately or anything else I can throw together in minutes so I can get back outside. I have made two dishes worth noting in the last few days. 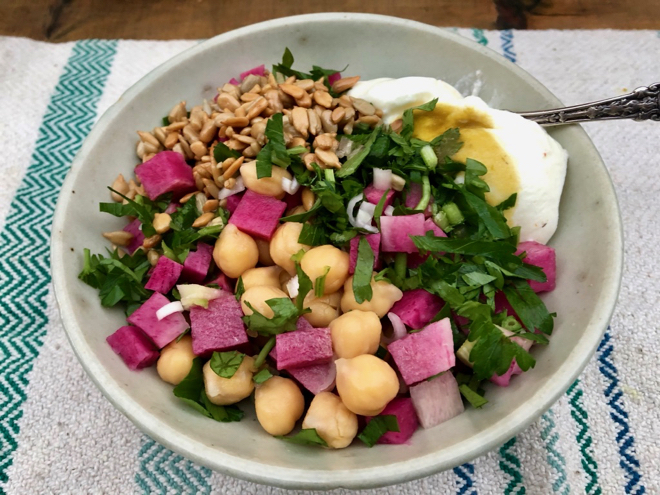 The first comes from one of my favorite cookbooks Plenty by Yotam Ottolenghi that you’ve heard me rave about here before. 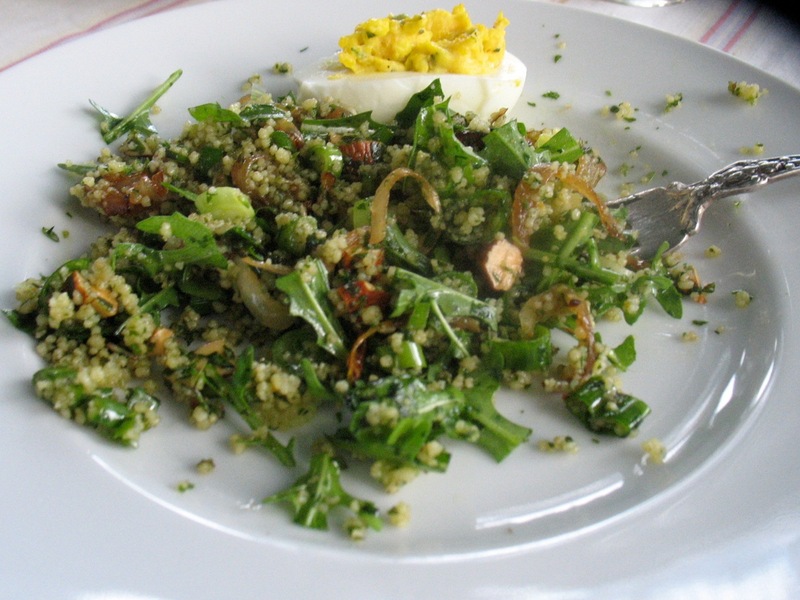 It’s called Green Couscous and is a herb-heavy, full flavored dish. If you, or you in combination with your neighbors grow mint, cilantro, tarragon, dill, parsley, and arugula, you might be able to make this salad on a moments notice. The recipe calls for toasted pistachios but I didn’t have any and substituted toasted almonds which worked beautifully. This recipe is not super quick. It has a few more steps than most of my dishes but it’s well worth it. I know our spring here in the Pacific Northwest was cooler and wetter than others so if you no longer have garlic scapes (tops, whistles) in your neck of the woods just file this away for next year. Garlic scapes are the long, elegant stalks that grow up out of a garlic plant. So while the head of garlic is finishing up its growth underground the plant gives us a fragrant, sweet, tender shoot to work with as well. These scapes make a wonderful pesto so if you have some in your garden or see a bunch at the farmers market or in your CSA box, this is one thing to do with it. 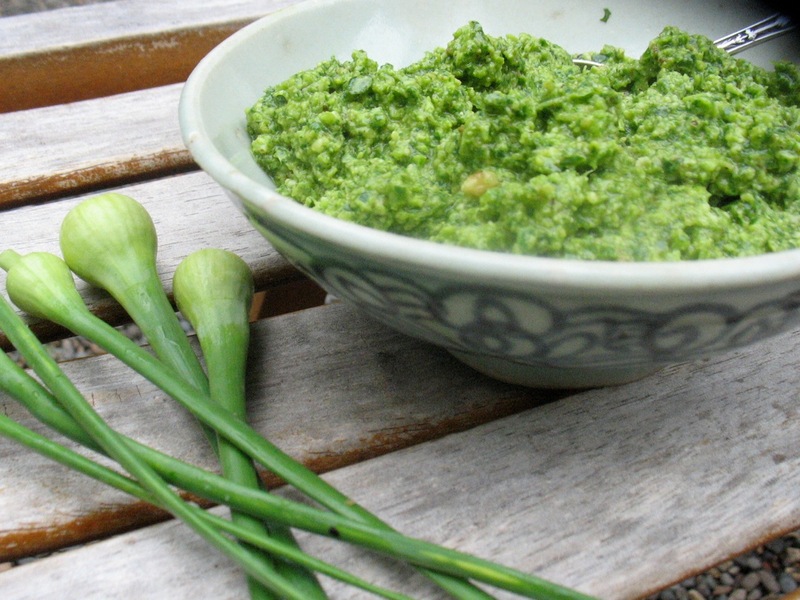 Garlic Scape Pesto. Next to the bowl of pesto you see the very tops of the garlic scapes which hold the flower of the plant. You want to use the scape right up to this part but I typically don't include the immature flower in the pesto but come to think of it I'm not sure why. . . . Roughly chop the garlic scapes, with our without the very top, flower part (See note in caption above). Process the nuts and cheese in a food processor. Add the remaining ingredients and process until smooth. Adjust seasoning to taste. 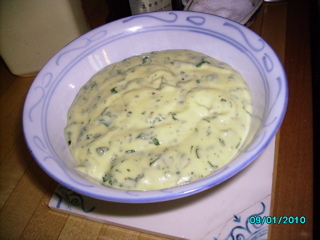 Serve on toasted bread, with pasta, potatoes, eggs dishes other grains. . . .
P.S. Two spots left in my August Eat Better Series. Save money, eat well, fewer trips to the store and more fun in the kitchen . . .